Are you looking to escape the harsh winter that is just around the corner? How about spending some time on a sun-kissed beach, gazing at the endless expanse of the sea? If this is your idea of a relaxing vacation, then head to the unspoilt island of Lesvos in Greece. While you are there, you must book your stay at Aegeon Hotel. Located in Kalloni on the island of Lesvos, Aegeon Hotel lets you spend a leisurely time amidst unadulterated natural beauty. The property is situated just 150 meters away from the Skala Kallonis Beach. It also falls within 10 kilometers of Kalloni Salt Pans and Iera Moni Limonos. 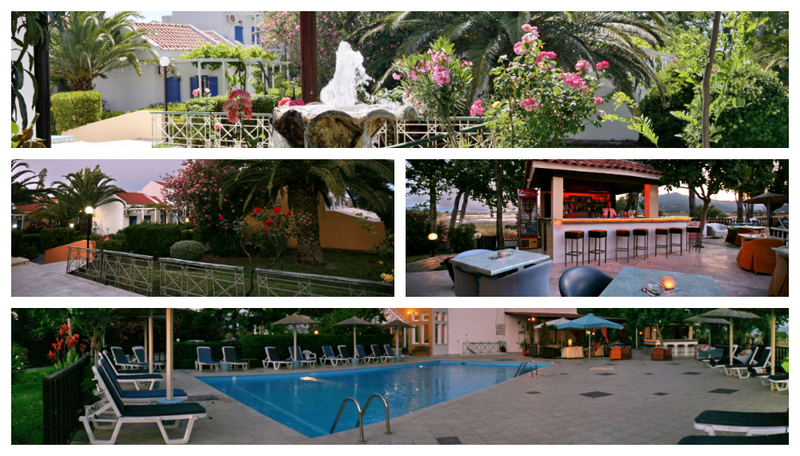 Its unique location makes Aegeon hotel the ideal base for exploring the Greek island. The unique holiday complex, built in a traditional Aegean village style, consists of 47 spacious rooms. Each room is adorned with modern yet simplistic furniture. Standard facilities such as air-conditioning, refrigerator, housekeeping, laundry, and free Wi-Fi are available. Bathrooms feature a shower, toiletries, and 24-hour hot water supply. The rooms, equipped with double or twin beds, can accommodate 2-3 people easily. Extra beds/cribs are available on request. Each room opens to a large private patio, from where guests can enjoy lovely views of the garden and sea. The property also provides free self-parking to all guests. Every morning, the restaurant serves a delicious English buffet breakfast including a variety of freshly baked bread and cakes. Guests can also savor the taste of traditional Greek delicacies. Don’t miss the lip-smacking fish and ouzo accompanying these dishes. Recreational facilities include a large swimming pool and a spacious sunbathing area. Spend a tranquil afternoon soaking all the sunshine on one of the sun beds and when your throat starts to dry up hit the poolside bar for some cocktails. Apart from the poolside bar, Aegeon Hotel also features two lounge areas where guests can relax in the evenings. A library and a couple of cafes are also available inside the complex. Guests can also take a walk in the picture-perfect garden area. The hotel staff and administration are always on their toes to ensure that you have a comfortable stay. Their amicable attitude is a reflection of the traditional Greek hospitality. The hotel allows you to rent safety deposit boxes at the reception. Concierge services can also be arranged on request. A beach holiday is no fun unless you spend endless hours admiring the sea. Take a short 10-minute walk from Aegeon hotel and you will reach the picturesque Skala Kallonis Beach. You can also rent a bicycle from the reception to explore the island on your own. Rental charges are applicable as per actuals. Stroll down the sandy beaches during daytime and visit one of the fish tavernas. They serve some of the most drool-worthy seafood dishes. You will be spoilt for choice when asked to select between sardines, shrimps, oysters and a plethora of fresh seafood. Enjoy these delicacies to the sound of local Greek music. The area is equally lively at night when the crowd gathers in vibrant nightclubs. Other places of attraction include Kalloni’s main square area, located 800 meters away. The Museum of Industrial Olive Oil Production, situated 10 kilometers away from Aegeon Hotel, is also worthy of a visit. Nature lovers can also indulge in bird-watching along the pristine coastline. If you are looking for an isolated getaway with your family, Aegeon Hotel is where you should be headed to. Spacious rooms, amicable staff, and the tranquil surroundings ensure you have the most relaxed holiday with your family and loved ones. No wonder this property is highly sought after by couples and families alike.